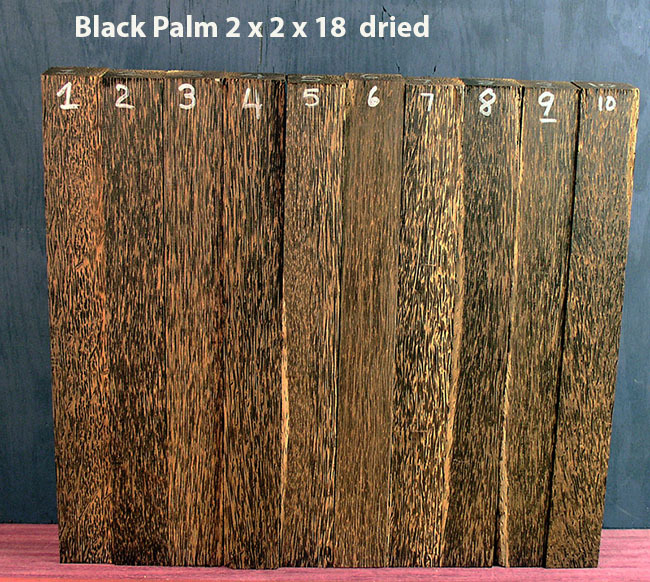 Black Palm and Red Palm are interesting woods which come from the outer hardened area of a type of palm tree. 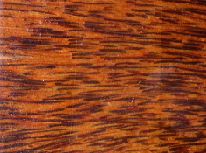 While the wood is called black or red, it actually has black or red flecks on a light or deep tan background as above. Sometimes the flecks are very close together and the piece looks almost black or reddish. It is also possible for the flecks to be further apart. 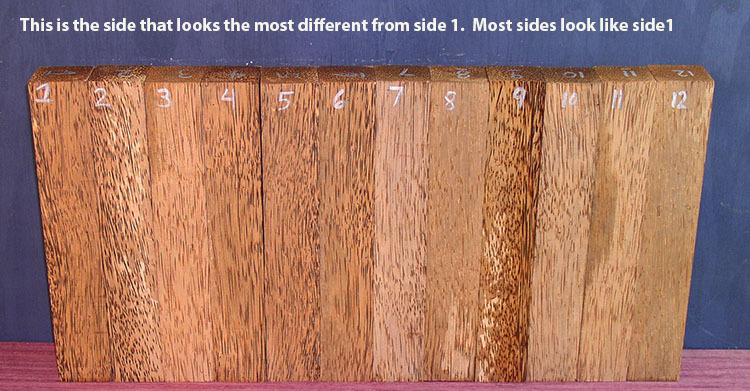 Because this wood only comes from the outer hardened areas, sizes can never be very large. The end grain of the wood is also interesting and looks like hammered leather when used as an inlay. It is best to dry it in thin or rough turned pieces. It is fairly heavyweight when dry. In some cases, it is a good idea to reinforce it periodically while working with it by using thin superglue. Red palm is listed/pictured below and tends to have a little bit lower density then black palm. Generally the darker a piece of palm wood is, the heavier it is. 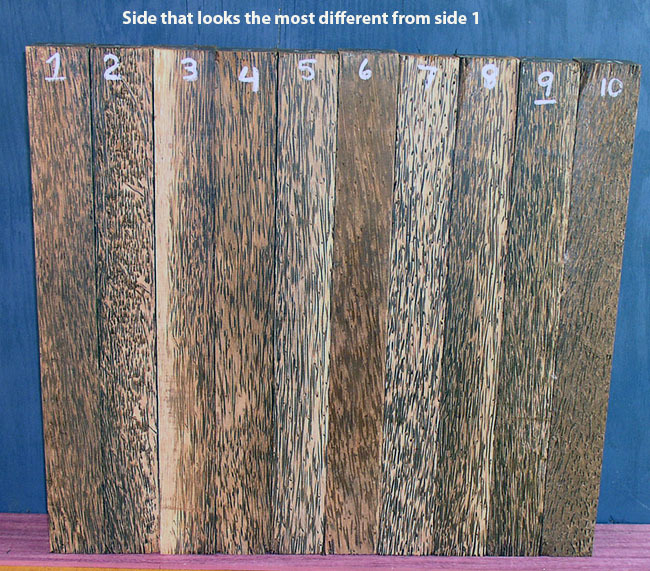 SAMPLE PHOTO of Dried pieces of BLACK palm in 2 x 2 x 18 inch size. 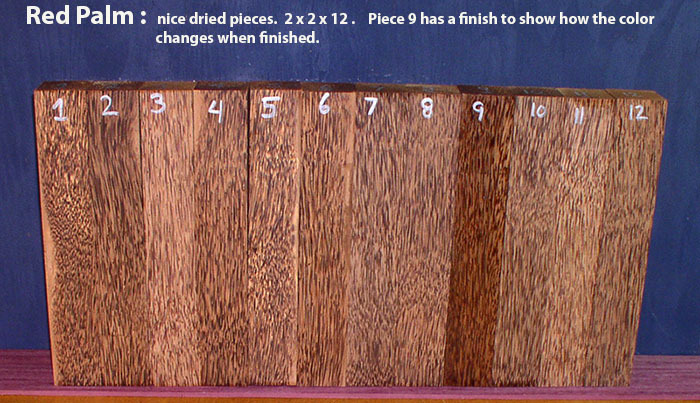 Dried pieces of Red palm in 2 x 2 x 12 inch size. The nature of this wood is that any piece over about 1.5 inches thick usually has one side that is lighter then the others. This is because the part of the tree we call palm wood is just the outer harder layer. The inside is usually white and soft and fibrous. The thicker the piece, the closer it gets to the core, so the lighter it will be. Sometimes you can even get all black 3 x 3 x 12's, which must have come from a very large palm tree. So about 3 sides look something like the picture above. When you click the above photo, you'll see the lightest side. Every other side is darker then the lighter side and usually looks like the above photo. Please order by number below. If the item is missing below , that means the piece is sold.